…at Pahoa High and Intermediate School for a message about the dangers of underage drinking. 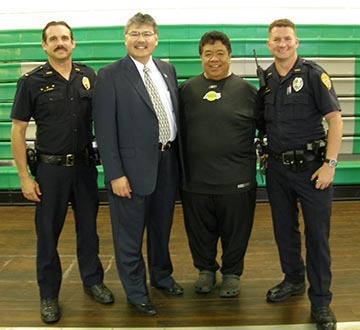 The Hawaii Police Department teamed up with U.S. Attorney Ed Kubo, Chef Sam Choy, the Hawaii County Prosecutor’s Office, officials from Pahoa High and Intermediate School and members of the community to present a message to students at Pahoa School Thursday (March 13) about the dangers of underage drinking. A culinary arts teacher and student helpers prepared country stew from Choy’s family recipe while Choy urged the students in the Pahoa gymnasium to set positive goals for themselves instead of using drugs and alcohol. Kubo shared newspaper stories about teenagers who have been killed in Hawaii either by drinking and driving or by being hit by a drunk driver. A video he showed about a mainland young woman captured the students’ attention. Twenty-year-old Jacqui Saburido got hit by a drunk driver in a crash that killed her two friends and melted the skin off her face. The “before” and “after” pictures offered a dramatic depiction of what can happen when someone gets behind the wheel after drinking alcohol. The program was part of the Pahoa Weed and Seed program, which aims to weed out crime and plant the seeds of community development.